Over the past few months a number of reports have appeared that were critical of screening for breast cancer. However, a paper published last week in the Journal of the American Medical Association (JAMA) has generated considerable interest, including prominent articles in the New York Times and the Wall Street Journal. It would seem that the pendulum may be swinging in the other direction, towards public confidence in the expectation that screening, and early diagnosis of breast cancer, can save lives. 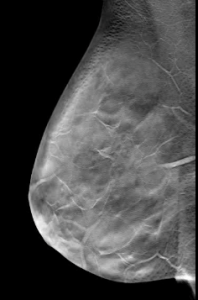 Entitled “Breast cancer screening using tomosynthesis in combination with digital mammography,” the JAMA article pooled the data for 13 clinical centres from across the United States. As described previously, digital breast tomosynthesis, or DBT, is a technique in which 10 to 12 projection views over an arc of about 30 degrees are acquired, and then the 3D volume of the breast can be reconstructed from multiple 2D projections using a mathematical algorithm. The synthesized images can be played back as a movie (click on image at right) and, with the removal of the overlapping tissue that bedevils a traditional mammogram, cancerous lesions can be more readily identified. Conducted between 2010 and 2012, this important project involved 454,850 screenings: 281,187 with full-field digital mammography (FFDM) alone and 173,663 that combined FFDM with DBT. Sarah Friedewald and her co-authors showed that DBT improved cancer detection from 4.2 per 1,000 women scanned to 5.4 per 1,000. It did particularly well for the more dangerous, invasive cancers, while the addition of DBT also lowered the recall rates, another positive benefit. Hologic is the only company that currently has FDA approval for DBT, which it has had since mid-2011, although GE Healthcare and Siemens both recently submitted their own pre-market approval (PMA) applications. At a reported cost of between $400,000 and $500,000 – about twice the price of a standard FFDM system – DBT technology is expensive. However, when it can be conclusively shown that DBT significantly improves diagnostic accuracy, more women’s lives will be spared.